17 year old Private Joseph Plumb Martin (1760-1850) recounted this memorable Thanksgiving meal in Pennsylvania with wry humor, and mentioned it several more times in his 1830 memoir. "While we lay here there was a Continental thanksgiving ordered by Congress; and as the army had all the cause in the world to be particularly thankful, if not for being well off, at least it was no worse, we were ordered to participate in it. We had nothing to eat for two or three days previous, except what the trees of the fields and forests afforded us. But now we must have what Congress said - a sumptuous thanksgiving to close the year of high living, we had now nearly seen brought to a close. Well - to add something extraordinary to our present stock of provisions, our country, ever mindful of its suffering army, opened her sympathizing heart so wide, upon this occasion, as to give us something to make the world stare. And what do you think it was, reader? - Guess. - You cannot guess, be you as much of a Yankee as you will. I will tell you: it gave each and every man half a gill [1/4 cup] of rice, and a table spoon full of vinegar!! After we had made sure of this extraordinary superabundant donation, we were ordered out to attend a meeting and hear a sermon... I remember the text... “And the soldiers said unto him, And what shall we do? And he said unto them, ‘Do violence to no man, nor accuse anyone falsely.’” The preacher ought to have added the remainder of the sentence to have made it complete, “And be content with your wages." But that would not do, it would be too apropos; however, he heard it as soon as the service was over, it was shouted from a hundred tongues. As we returned to our camp, we passed by our Commissary’s quarters, all his stores, consisting of a barrel about two thirds full of books of fresh beef, stood directly in our way, but there was a sentinel guarding even that; however, one of my messmates purloined a piece of it, four or five pounds perhaps. I was exceeding glad to see him take it, I thought it might help to eke out our thanksgiving supper; but, alas! how soon my expectations were blasted!—The sentinel saw him have it as soon as I did and obliged him to return it to the barrel again. So I had nothing else to do but to go home and make out my supper as usual, upon a leg of nothing and no turnips. The army was now [December 1777] not only starved but naked; the greater part were not only shirtless and barefoot, but destitute of all other clothing, especially blankets... 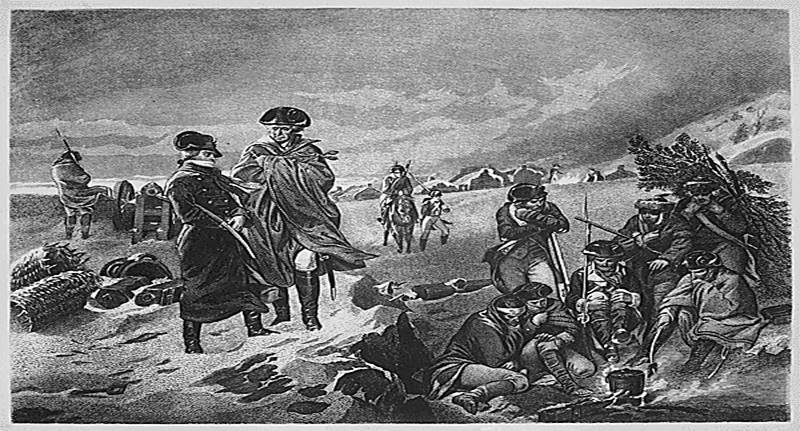 But hunger, nakedness and sore shins were not the only difficulties we had at that time to encounter; --- we had hard duty to perform and little or no strength to perform it with.... we marched for the Valley Forge in order to take up our winter-quarters. We were now in a truly forlorn condition, -- no clothing, no provisions and as disheartened as need be... a few days before christmas."